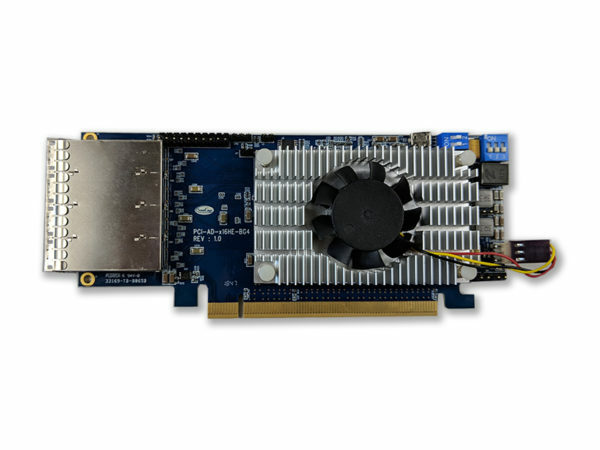 Description: PCIe Gen4 x16 host card w/M.2 and x8 straddle mount support. UART and JTAG test ports. Based on Broadcom Atlas A0 Gen4 PCIe switch. Broadcom A0 parts require setting lane width modes through their CLI via MicroUSB. Description: Gen4 PCIe x16 external host card with Broadcom Atlas A0 PCIe switch w/1×4 SFF-8644 receptacles. Supports PCI Sig and direct attach modes. Supports 1×16, 2×8, 4×4 and 8×2 configurations. Broadcom A0 parts require setting lane width modes through their CLI via MicroUSB.